Don’t walk, weld – that’s how Miller sum up the benefits of their smart, state-of-the-art multi-process welding machine, the XMT 350 FieldPro. Through Welding Industries Australia (WIA), this equipment has recently been released in Australia. One of its key advantages is that it uses ArcReach, a technology that gives welding operators control of their equipment through an ArcReach equipped wirefeeder or Stick TIG control. This means they no longer have to make the trip from the welding joint to the power source to change any of their welding parameters, instead, they can simply make the adjustments at the joint via the accessory. WIA have been testing the equipment with various customers nationally and the feedback has been positive. According to Mr Hefferan, the productivity benefits will become apparent with this technology in just one day. For example, if a welder walks from the weld joint to the machine four times a day that can easily add up to one hour. Multiply this by days, then weeks, and then by a year and the costs are substantial. If a welding operation updates their equipment to the XMT FieldPro with ArcReach, the savings may translate to over $10k per year in savings, per welder. Gaining back those lost welding hours will have a very quantifiable and positive impact on productivity. Not just in time and costs saved but in the performance of the welder and the quality of their work. The are two unique ArcReach technologies that are exclusive to the XMT 350 FieldPro. The first is Cable Length Compensation (CLC), a technology that ensures that the setup of welding parameters is fast and seamless by automatically compensating for voltage drops on the weld cable. This means that the voltage a welding operator sets is the voltage they will get at the weld, even if the power source is hundreds of feet away. Traditionally – with older machines – the welding operator has to make adjustments for the voltage drop manually. The other central component of ArcReach is the Adjust While Welding (AWW) technology. This allows for adjustments and parameter changes to be made at the wire feeder or remote without having to stop the arc, giving welders the opportunity to compensate for heat build-up, changes to the weld position or other variations in the fit-up. An additional feature that is exclusive to Miller products and available on the XMT 350 FieldPro with ArcReach is the Auto-Line technology. This automatically calibrates to the input voltage when connected, with a range of 240 to 480 volts, on a single or three phase. It is particularly useful on jobsites that have unreliable input power or use a generator. The AutoLine keeps the welding output constant even if the input power varies by either plus or minus 10 per cent. The Miller XMT 350 FieldPro also produces a stable arc and consistent weld quality, regardless of the weld process. As a multi-process machine it supports: Stick, MIG, Flux-Cored, Pulsed MIG*, RMD*, TIG and Air Carbon Arc Cutting and Gouging (13mm) processes. It is suited to welding in construction, shipbuilding, infrastructure, agriculture or power generation plant environments. Moreover, this new release will improve the safety of welders at their job site – which is always a concern. Most sites are cluttered with cables and various equipment so reducing the travel time with ArcReach will reduce the chance for slips, trips or falls. 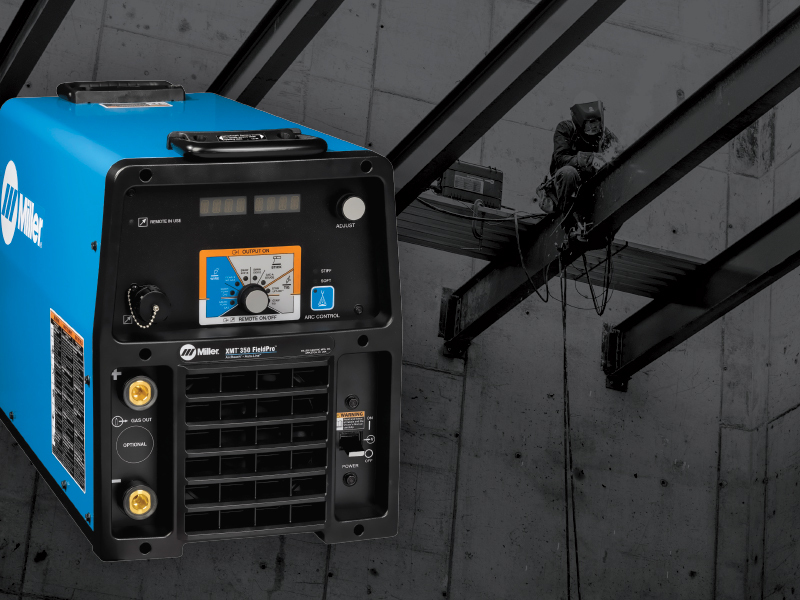 The XMT 350 FieldPro with ArcReach remote control welding technology is now available in Australia. Find out more.